Exoplanetology has progressed in several leaps. Initially, astronomers concentrated on simply discovering new planets outside our own Solar System. Having found over a thousand such bodies, and measured basic properties indicating their likely masses and for some of them, their sizes, the next step was to characterise them. This characterisation initially focused on the planets' atmospheres, as generally only the atmospheres emit and reflect light. Now, we are on the brink of the new era, where characterisation of exoplanetary surfaces and interiors could become feasible. Characterisation of an exoplanetary atmosphere is possible in cases when the star-planet arrangement is such that the light originating from the host star occasionally travels through the planet's atmosphere - an event described as a planetary transit. If the atmosphere is sufficiently dense, and is extensive enough, its most abundant constituents can produce a unique spectroscopic imprint on the background starlight. From this the chemical composition of the atmosphere can be determined. A very similar technique could be successfully deployed to study surfaces of exoplanets, if planets can be found whose surfaces are at least partially "see through". Prime objects for such observations are evaporating planets, whose outer layers get lifted into the surrounding space forming large, light absorbing/scattering clouds. The amount of light scattered by these clouds differs between shorter and longer wavelengths, depending on the size distributions of their constituent dust grains and their chemical compositions. This varying amount of scattering again leaves a unique imprint on the background light, which can be studied using multicolour photometry. KIC 1255 b in transit. Artist's impression courtesy of Maciej Szyszko [ PNG ]. Several potential candidates for such studies have been identified, including KIC 12557548, hypothesised to contain a transiting evaporating exoplanet which is so close to its host star that it completes an entire orbit (analogous to a year on Earth) in just 16 hours. KIC 12557548 b is thought to be a rocky planet more massive than Mercury, with a surface temperature of about 2100K. These properties cause a continuous loss of material through a wind, forming an extended tail of dust following the planet in its orbital path. Due to the self-limiting character of the mechanism driving the evaporation, the rate of dust ejection changes significantly between orbits, varying the amount of absorption observed during transits. This absorption produces a loss in the total observed light from the star, which can be measured as a depth (in per-cent) once every orbit when the planet and the entrained dust cloud passes across our line of sight to the star. 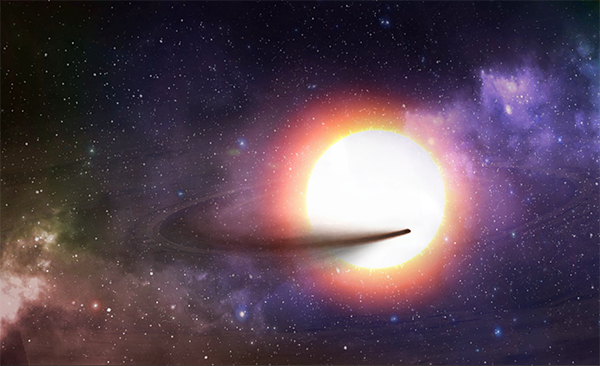 Astronomers observed KIC 12557548 on five nights in July 2013, using ULTRACAM on the William Herschel Telescope, to search for the colour dependence of the transit depth. To achieve the widest possible wavelength range with high enough signal-to-noise ratio, they used broad-band Sloan z', g' and u' filters. A clear transit signal was detected only on the first night (Figure 1). During the remaining four nights, the planet was in a quiescent period, with little or no dust cloud obscuring the star. As expected, the astronomers managed to observe differences in transit depths between the u', g' and z' filters on Night 1, with an increase in depth toward shorter wavelengths (Figures 1 & 2). This effect is consistent with extinction from the putative dust cloud surrounding the planet. Remaining nights allowed to constrain the size of the planet to less than 5.4 radii of Mercury. Figure 1. 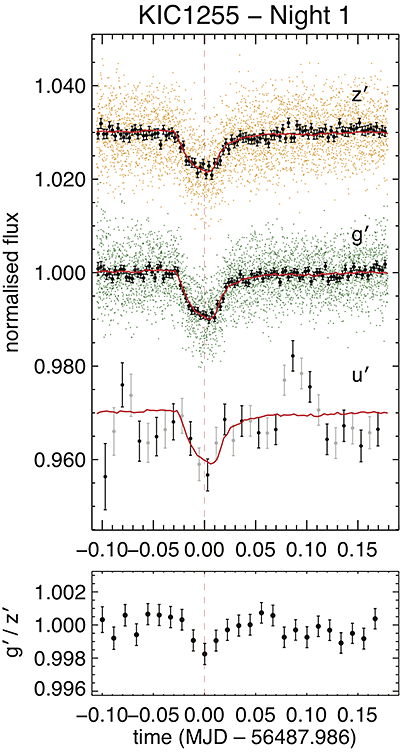 Upper panel: z', g' and u' light curves of KIC 12557548 from 14 July 2013; best model fits are shown in red, binned data points are shown in black and raw data points are shown in orange and green for z' and g' bands respectively. Lower panel: g'/z' curve. Credit: Bochinski et al. (2015) [ PNG ]. After modelling Night 1 transit depths with the Cardelli, Clayton & Mathis (1989) interstellar extinction law, the extinction depths observed are broadly consistent with the wavelength-dependence of the reddening seen in the interstellar medium (Figure 2). This is strong independent and direct evidence in favour of the dust-cloud model for the transits. The color dependence of the transit depth is consistent with extinction due to dust with grain sizes between 0.25µm and 1µm. Analysis of a larger number of transit light curves potentially offers the opportunity to measure the composition of the grains. This is an unprecedented opportunity to learn the make-up of a rocky extrasolar planet. By doing that astronomers can find out how typical our Solar System is, and learn more about how Earth and other planets were formed. The team will be attempting to carry out such observations on the William Herschel Telescope in the summer of 2015. Figure 2. 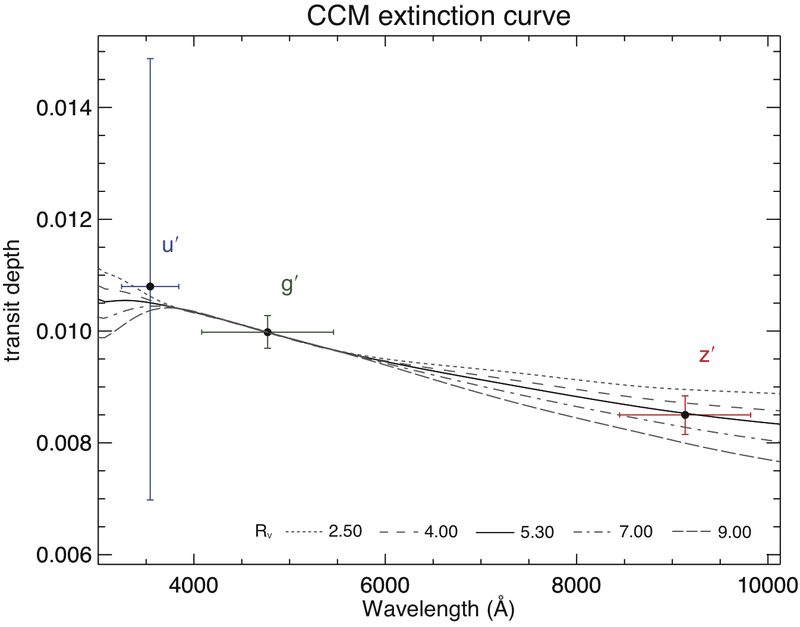 The Cardelli, Clayton & Mathis (1989) interstellar extinction law fitted to our Night 1 transit depths. The best fit value was RV = 5.3 (solid line). Extinction laws for values of RV ranging between 2.50 and 9.00 are also shown. Credit: Bochinski et al. (2015) [ PNG ]. Bochinski, Jakub J.; Haswell, Carole A.; Marsh, Tom R.; Dhillon, Vikram S. and Littlefair, Stuart P., 2015, "Direct evidence for an evolving dust cloud from the exoplanet KIC 12557548 b", ApJ Letters, 800, L21.